i love to read. in fact, sometimes i actually forget how much i love to read! but then when i get back into a good fiction novel i find it's all i can do not to sit there and finish it. i hope to instil this same passion for stories in my little sniff. we've received some wonderful children's books already - including classics like love you forever and goodnight moon. and some of my favourite gifts are the ones pictured below. 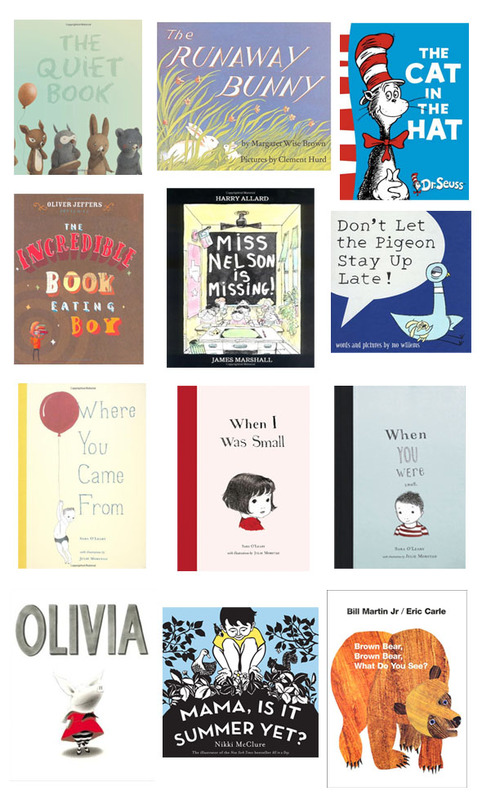 but i've also come across some other wonderful books so i thought it would be fun to put together a wishlist for jackson. some books, like the cat in the hat and miss nelson is missing are favourites from my youth. others, like the henry series (when you were small etc), olivia, mama is it summer yet, and the quiet book are elegant combinations of storyline and artwork. and the rest i have never read but were recommended by other bloggers. this one just cracks me up. although you can probably only read it for the first six months or so because of the profanity - there is no doubt that "go the f**k to sleep* is something every parent thinks...often. this is the book version of the miniature paintings in jackson's nursery - by the artist i work for. there are no more copies of this book available so it's very special to us. i loved robert munsch as a child and this one - all about candy, excess and a father's love for his daughter is my favourite. when you were small | olivia | mama, is it summer yet? | brown bear, brown bear, what do you see? you need to add i'll love you forever by robert munsch to that list - one of my favourites! I love 'The Incredible Book Eating Boy' and most of Oliver Jeffer's books....good pick!